As you know putting is an art and a science, and mastering it depends on how well you can train the fundamentals of the stroke. Why should you listen to even a word I say? I'm Shaun Webb, and I've spent a few decades playing and teaching others play golf, and during these years I've learned a ton on how to improve your game. Today I want to offer you the chance to get the best training mirror you can get your hands on, for an amazing price. Plus you'll get my personal guarantee that you're buying a high quality product, designed and tested by yours truly. So, please don't wait any longer and grab on of these training mirrors and I promise you'll be happier golfer (and better putter) once you start using it. 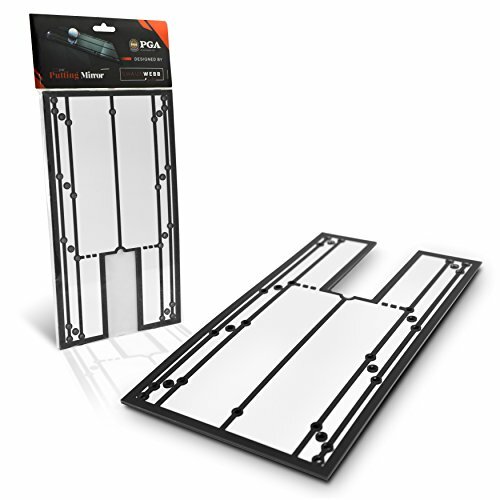 PUTTING IS 43% OF THE GAME- Train a tour putting stroke with the help of my putting mirror. DESIGNED BY PGA PRO SHAUN WEBB. This training aid will help you improve your stroke and remove compensations. PRACTICE ANYWHERE. This training aid can be taken wherever there's space to play. Carry it in your backpack, or golf bag and just put it away when you're done. If you have any questions about this product by Shaun Webb's, contact us by completing and submitting the form below. If you are looking for a specif part number, please include it with your message.